Finding the best RV water heaters for your mobile and recreational vehicle, so you can travel with the comfort of your home and use hot water anytime and anywhere. What is DSI? Gas vs. electric, Atwood vs. Suburban. Do you have a problem with a heater? Use the following troubleshooting tips for easy repair. Find out how to keep the RV water heater efficient. Most of the water heaters designed for RV use are tank-type style and they come with the capacities from as low of 4 gallons to high 16-gallon sizes. The most common and popular size is the 6-gallon unit, which is good enough for a decent shower or a smaller pile of dishes. Good examples are the following top-selling units on Amazon; Suburban 5117A and Atwood 96110. These devices are usually installed outside the RV which makes them convenient for service without entering the vehicle. Outside installation allows an easy access to the exterior door, and that eliminates the need for the service technician to enter your vehicle. RV hot water heaters are designed to mount perfectly, and flush in the RV sidewall, for the nicer look. 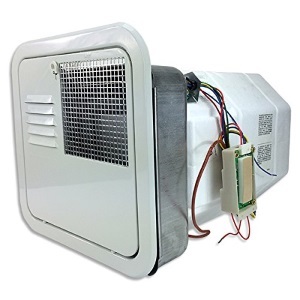 Also, most of the manufacturers of the RV water heaters; Atwood, Suburban, and others, offer matching access doors, which ensures a clean and attractive exterior of your coach. RV water heater is equipped with all the necessary components for compact, safe and lightweight package. This includes a small, insulated tank and multiple protection features such as those against the high temperature or pressure. Tankless water heaters do not store water, they heat water on demand while delivering an endless supply, as long as there is a sufficient amount of fuel. Yes, they can cost more, but the advantages are better energy savings since there is no heat loss from the standing water. Tankless are smaller than tank-type and less prone to leaks. One of the popular models is Girard. Propane heaters are similar to gas heating units used in homes. They use a pilot light to light the gas used for heating. The combustion air must be supplied from outside the vehicle while products of combustion are vented out. The ignition is pilot or electronic. The pilot is manually lit, and in a case when wind or other conditions extinguish the flame, you have to manually lit it again, while some heaters use the automatic relight option. The safety features prevent the gas from leaks. The electronic ignition is more convenient since it uses a simple switch from inside the RV. These models, where you light the pilot at the touch of a switch from inside the cabin, are called Direct Spark Ignition or DSI models. Or, in short, instead of manual lighting the unit will light automatically. This is the recommended option, and one can be purchased for a few hundred bucks. RV hot water heaters can also use electricity and run either off the 120 V electrical hook up or generator. The heating elements which are used for water heating are screw-in or bolt-on type, and they are easily replaceable if the malfunction occurs. In this application, the heat exchanger is used to transfer the heat, generated by the engine and through the coolant system, to the water. This is a very economical and practical way of water heating, usually combined with other sources, so when you arrive at the destination hot water is ready for use. Combination water heaters are usually operated on both LP gas and 120-volt electric option. The propane option is used when there is no electricity available, while the electric when you run out of gas or want to conserve the fuel. Both lighting options; manual and DSI are available. The main manufacturers of RV water heaters are Atwood and Suburban. They both offer several models that run on electricity, propane gas, engine heat or a combination. There are also tankless-type heaters such as Girard that do not have a storage tank, but the heat exchanger. These models are lighter than tank-type, use less energy and are producing hot water on demand with no recovery time. The main difference between these two brands is that Atwood uses an aluminum clad tank, which eliminates the need for the anode rod and makes them lighter, while Suburban uses this metal tank and the anode against corrosion. Also, Suburban offers five different sizes, ranging from 4 to 16 gallons, while Atwood has only two; six and ten gallons. Note: If planning to replace your old RV water heater with another brand you have to check the model size, sidewall cut-out, and depth dimensions. One of the best ways to keep your RV water heater running smoothly is to protect it from the sediment build-up and other deposits. That is why it is recommended to inspect and clean the unit and its elements, especially at the end of the season or before. For example, if the heating element on the electric unit, or gas burner on the gas-type, is not performing as expected, you might have an issue with the sediment deposits, and that will require you to clean or replace the element. Due to the same reasons water might be dripping from the relief valve. For the propane unit, check the vents and exterior door screen, and ensure that there are no obstacles to affect the air flow. On the Suburban heater, inspect the anode rod for the deterioration and replace it if needed. One solution is to use the filters. The other one is to flush the system regularly. The best is to consult the manufacturer’s instructions or expert advice. Winterizing is another must to do operations. To protect the heater from harsh weather, drain the unit and clear water from all the lines. As we like the comfort of our home, we often desire to have the same luxury and convenience when away, camping or RV-ing, for example. And that is why it is normal to expect when we buy or rent an RV, that water heaters and hot water are available. The odds are, either Atwood or Suburban is to be found in such vehicles, as they are the most popular among tank-type, offering some great features as described in its detailed reviews.